The perfect experience for adventurers!. Nepal's most popular trekking peak to climb.. The perfect peak for adventurers!. Summit Island Peak at 6187m. Trek to Everest Base Camp and walk on the Khumbu glacier. Visit an ancient Buddhist monastery and interact with Sherpa villagers. View landscapes including the Himalayan panorama that gradually come closer. Experience authentic Sherpa culture in the mountainous villages. See highland monasteries and the sacred Mani Walls engraved with Buddhist prayers. Climb three attractive peaks in the Everest region: Mera, Island and Lobuche. Cross the challenging Amphu Laptsa La Pass at 5,845 meters. Climb Island Peak, a stunning peak that looks like an island in a sea of ice. Experience friendly Sherpa cultural villages in the midst of towering mountains. Enjoy striking views of world’s popular mountain ranges including Mt Everest and Mt Nuptse. Great panorama view from the Top of the island peak.. Spending the night at tent camp at Base camp.. Summit to Island peak at an elevation of 6187 meters. Explore the rich Sherpa culture, traditions and lifestyle. Remarkable views of Khumbu Ice fall and Makalu Himalayan Range. The ideal peak for your first Himalayan climbing experience!. Summit a real Himalayan peak +6100 m..
Scenic Gokyo Ri, Kala Patthar, Cho La Pass - also improving your acclimatization. Most popular and achievable climbing peak at 6189m. 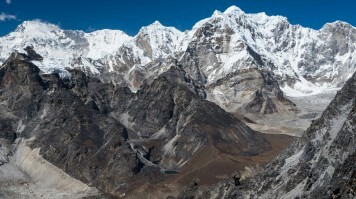 Aid with acclimatization for peak lcimbing with Everest Base Camp and Kalapatthar hikes. Stunning views of the Everest Himalayan Range. Centuries old Tyangboche Monastery and Pangboche Monastery. Exploring Namche Bazaar, Khumjung Village and Pangboche Village, Sherpa culture and custom. Trek to Everest Base Camp, from where the journey to world's highest mountain begins. See stunning views of the magnificent Himalayas. Summit Island Peak, known as Imja Tse in the local language. Climb Mera (6476m) & Island Peak (6189m) on a fully supported expedition led by expert climbing guides. Travel on a proven itinerary with ample acclimatisation and contingency days. Take in stunning views from the summits of two of Nepal's classic "trekking" peaks. Enjoy spectacular views of the Khumbu Icefall & the Himalayas. Trek to the base camp of Mount Everest. Summit Island Peak, also known as Imja Tse. Enjoy amazing views of the Himalayas, including Mount Everest. Travelling to Nepal? Chat with a local travel specialist in Nepal who can help organize your trip. Nepal Climbing Adventure Pvt. Ltd.
Glorious Himalaya Trekking Pvt Ltd.
“Just complete the Everest Base Camp Trekking! Unfortunately didn’t make it with Island Peak die to bad and cloudy weather but I promise that I will come back next year to make that happen! Unique Adventures tried their best to make every wish come true! Island Peak, also known as Imja Tse, is a magnificent peak in the Himalayan range of eastern Nepal. Standing at a staggering height of 6,189 m /20,305 ft from sea level, this mountain is the starting point of the Imja River. 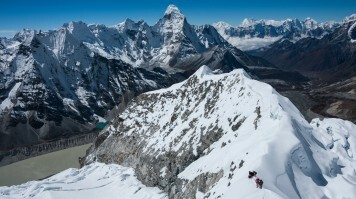 The Island Peak is a great first expedition for beginner mountaineers. 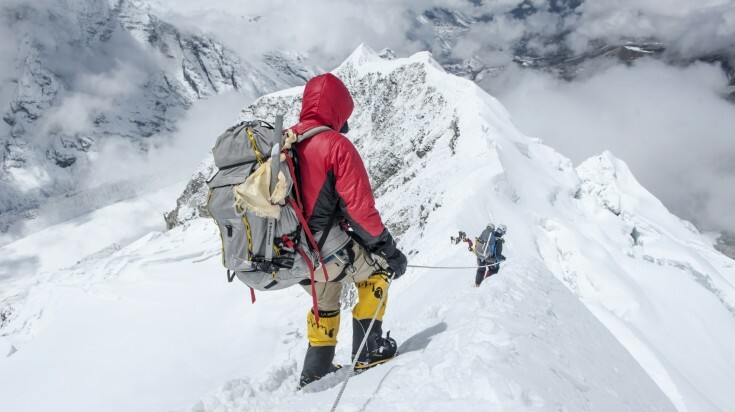 The climb is mostly non-technical, yet fairly challenging – perfect for mountaineering enthusiasts who are just starting their Himalayan adventure. The “Island Peak” was named so in 1951 by the famous explorer Eric Shipton, because the peak seems to rise from a sea of ice. First climbed in 1956, the peak was a training exercise for the team that eventually climbed the Everest and the Lhotse. The Island peak trek includes a journey to the beautiful Khumbu valley and an acclimatization hike through the Everest Base Camp. From the high vantage point of Kata Pattar, you can enjoy unrivaled views of the nearby Himalayan giants including the Everest. During the trek, you’ll also travel through the challenging Kongma La pass, which leads to the Imja valley. Although you’ll stay in comfortable lodges for most of the trek, you’ll have to set up tented base camps before the actual climb. 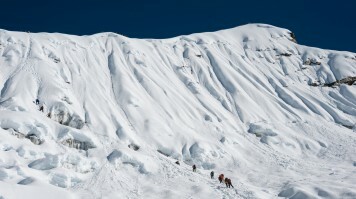 The ascent to the peak features plenty of glaciers, moderate snow and a lot of ice climbing. 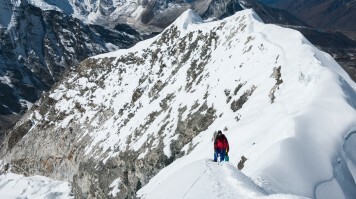 Although it is mostly a non-technical climb, you’ll need some basic snow climbing skills to get to the peak. Once on the summit, you’ll get a breathtaking view of the nearby Lhotse, Everest, and other Himalayan peaks. One thing is for sure: the climb to the peak is extremely satisfying and absolutely worth the effort. Climb Difficulty: Little Difficult - Require no technical expertise. The duration will be approx. 16-24 days, pending from when the companies count the starting point, and whether they include sightseeing in Kathmandu as part of the climbing package or not. The trip will start in Kathmandu from where a flight is taken to Lukla, the airport that gives access to the entire Solu Khumbu and Everest region. The first 8-10 days will be spent trekking on the famous Everest Base Camp trail. You’ll start trekking from Lukla at an altitude of 2,800 m and reach Island Peak Base Camp at an altitude of 5,200 m from where the climb of Island peak will start, ultimately reaching the top at 6,189 m.
After summiting the peak you will return back to Lukla and fly back to Kathmandu, where the trip will end. For exact itineraries please see the day-by-day itinerary available under each trip.